The colors and smells of the forest don’t stay with you when you leave. Yet when you return, it’s like meeting an old friend. Vaguely familiar, yet forgotten. You need to reconnect again. How you remember a forest also depends on the season in which you saw it. And much of what you know depends on what you saw in that snapshot of time. This time, it’s the beginning of winter and the skies are clear, the sun is hot but in a pleasant way. Even the ‘irritants’ respond to the seasons. The ants are everywhere, creeping up unnoticed and suddenly a sharp stinging pain. The ticks are numerous in this dry time to make up for the fewer leeches whose time, or rather season, is yet to come. I much prefer the ‘harmless’ leeches to the little ticks, which can itch for months afterwards. The Lisu have a smart way of dealing with ticks. Before reaching the camp, they make a small smoky fire with twigs and dry leaves. Then you dance around the fire, waving and beating your clothes, letting the smoke in and the ticks out. The first time they stopped on the trail to do this, I remonstrated with them about making a fire in the forest, but soon joined in the dance myself. If you wait till you reach camp and sit around in your clothes, the ticks will have got you. On every visit, I learn something new. Even a forest I first went to in 1995 and have spent considerable time in since. Maybe a more observant person would have had it all figured out much earlier, but in a way, it’s nice; this slow learning and finding ‘new’ things each time. There’s too much happening in the forest to take it all in at one shot. The animals know what each season will bring, when to expect bountiful fruits and when, a dry run, what to eat, where to go looking for food and how to go about living out the whole year in the forest. It’s still a moment of discovery to find that the Phulhingori tree (Echinocarpus assamicus) is leafless in November when in full bloom and that the flowers are yellow with a faint ephemeral fragrance. Insect-pollinated? I don’t know. 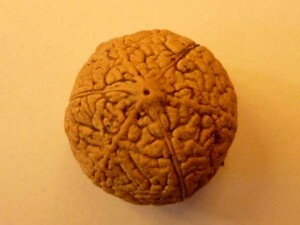 The single round large seed I find on the forest floor that looks like a convoluted brain. I have no clue what it may be. No fruiting trees nearby from which it could have fallen. Possibly dropped by a foraging bird. Or that the flat dry pods of the thorny climber Acacia pennata that elephants eat, ripen in March and have small flat brown seeds. 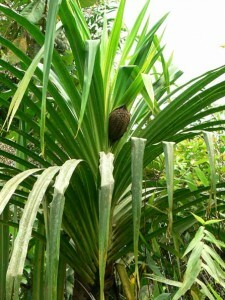 Or that the saplings of the Tokko palm (Livistona jenkinsiana) are eaten by elephants. They munch on the larger saplings as they amble along, gathering and stripping off the outer rim of the huge fan-shaped leaf leaving the saplings with a frayed and dried-up look. Tasty little tidbits that are a passing fancy. Many things that I learn on each visit to the forest. And countless still to learn. Small and trivial. The leaves of the awesome Rhaphiodophora, Pothos and numerous Piper species that smother and snake up the bark of giant trees. The bird’s nest ferns (Asplenium) that are everywhere shrouding the trees. Once, I saw a palm civet curled up and sleeping inside one in the canopy. 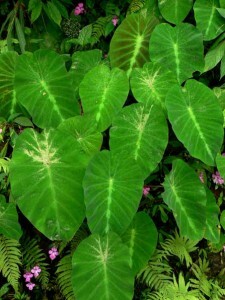 The patterns formed by the walls of Colocasia that line the paths and trails, great places to find colorful bugs. 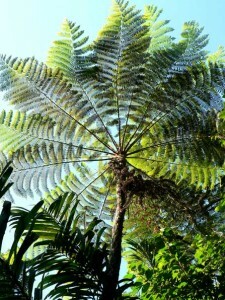 The giant hanging fern fronds that decorate the steep cliffsides. The tree ferns, relics from another time. 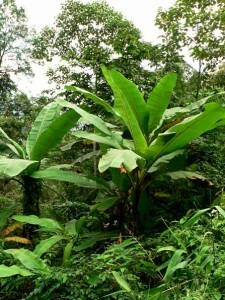 The grayish underside of the leaves of a Musa (banana) that is covered with a white powder which tribal people gather and rub onto their threads while weaving to make them smoother. The screw pine trees (Pandanus) that often perch precariously on steep slopes. I learn that its heavy fruits are eaten and dispersed by monitor lizards (from a study in the Philippines). 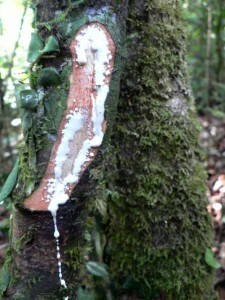 The magic liana with milky white sap that the Lisu assure me is the best natural adhesive. 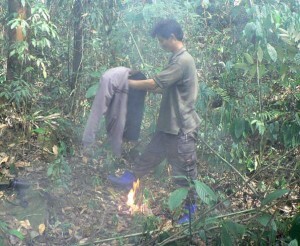 We routinely use a bit of the sap to bind torn clothes or shoes while camping in the forest. Still don’t know the scientific name. To me, it’s just the Super Glue Liana. Shades of green, leaves of every possible shape, texture and dimension. 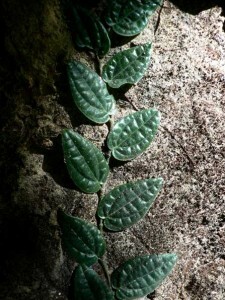 There is color too…on the forest floor, understorey and in the canopy. 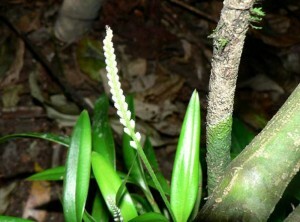 The saprophytic orchid with delicate tiny white flowers that I picked up from the forest floor in Pakke. And pressed in my field note book to show Dr. Haridasan in 1996. Epipogium roseum (africanus). Apparently first recorded in 1991 from Arunachal. Never saw it again since. All I had was an old dried flower. Till, funnily enough, I saw it everywhere in the forest on this latest trip to Namdapha..guess it just flowers in March-April and is seen ephemerally. Or maybe it decided that the time had come to remind me of its existence. This time around, I was trigger-happy. 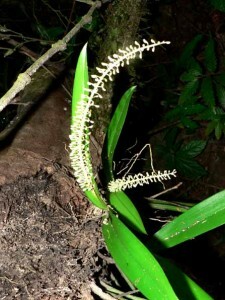 The terrestrial bamboo orchid (Arundina graminifolia) so aptly named, that grows in tall reedy clumps often by the roadside or streams, flowering in November. 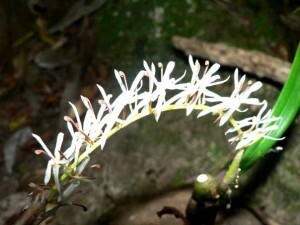 The epiphytic orchids, Liparis, Eria and Otochilus, sudden flashes of white in a dark forest. The image of a beautiful unnamed shrub from Namdapha (taken by Sara in 2004) lying forgotten on my computer. 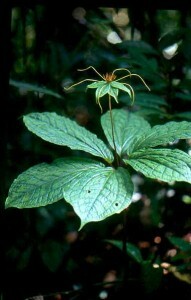 Professor Li Heng, an expert Chinese taxonomist who has spent a lifetime documenting the flora of the Gaoligongshan mountains in Yunnan, identified the image on my screen as Paris polyphylla, a rare shrub used in traditional Chinese medicine and also cultivated in China. 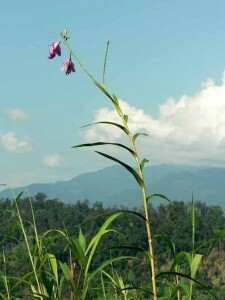 There are several species in this beautiful genus in the Eastern Himalaya. 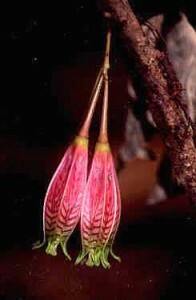 The pink and red lantern-like flowers of several Agapetes species ubiquitous on the forest floor in Namdapha in winter. 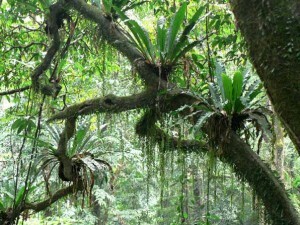 I have never seen the entire plant as the liana hangs high up in the canopy. 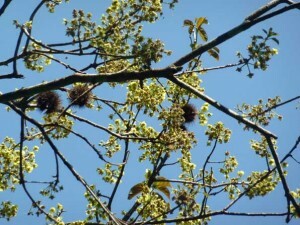 The flowers and fruits of Saurauia nepalensis, a smallish tree usually found along perennial streams, an important food source for birds in winter. The brilliant flowers of climbers like the Aeschynanthes, a trifle unexpected in the rainforest, and the purple splashes from the common roadside shrubs of Osbeckia and Oxyspora. The little flashes of colour from the many varieties of flowering Begonia. And the unforgettable splendour of Sapria himalayana, a rare root parasite endemic to Namdapha’s forests, making a brief appearance on the forest floor in some patches in winter. The stinkhorn fungus (Dictyophora sp.) with a netted veil billowing out like a skirt is another bizarre and beautiful creature of these forests. The trees, their bark and leaves, are a bewildering variety of shapes, colors, textures and patterns. They stand silent witness to all that happens in the forest with the changing seasons and time. The flowers of the Chhatim tree or Chatiana (Alstonia scholaris) as it’s known in Assam are blooming now, while an unknown flowering climber growing on the Chhatim tree has an overpoweringly sweet smell. The fruits of Prunus ceylanica that hornbills and barbets love to eat are beginning to ripen. I still remember back in 1998 when I first found the fallen fruits and saw the hornbills visiting these trees to eat the fruits. It took sometime to figure out the name. The bark and leaves of this tree smell like the almond tree which belongs to the same family Rosaceae; a way to identify Rosaceae species in the field as Dr. Rawat once told me. One of my favorite trees in this forest is the Lohajam (Syzygium macrocarpum), a sub-canopy tree which seems to mostly grow in patches near streams. 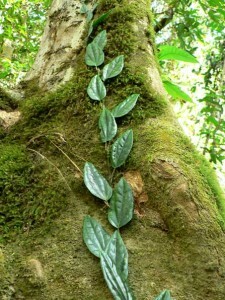 The leaves are huge unlike most other Syzygium species. This March, they were flowering, the flowers have a heady fragrance, the flower buds are purple, and when they open fully, they are large and white with long strands. I am not sure who eats the fruits, although I assume birds like them. Khekratenga (a Garcinia species), is another favorite. Monkeys disperse its fruits and the tree is more common in wetter forests like Namdapha which have more frugivorous primates. The ripe fruits are covered by a tough rind which when peeled off have a delicious orange-yellow fleshy pulp that melts in your mouth. Then there are other species that have pulpy sweet fruits that we like to eat while walking in the forest. These are mainly dispersed by deer, like Lepchipoma (Cheirospondias axillaris) and Amora tenga (Spondias pinnata). It is quite common to find piles of seeds all together where a sambar or barking deer may have rested for a while and regurgitated the seeds. Yet another favorite is the beautiful liana Tetracera tomentosa with scaly red bark like the Outenga (Dillenia indica) which belongs to the same family. Once in the early years, after a long walk exploring the forest, Japang stopped and before I could say anything, cut it in the middle, swung it around and asked me to drink the water dripping from inside. I remember it as the most delicious water I have ever tasted. Cold, with a sweet aftertaste and a smell like that of ripe Dhuna (Canarium sp.) fruits which are yummy to nibble on. 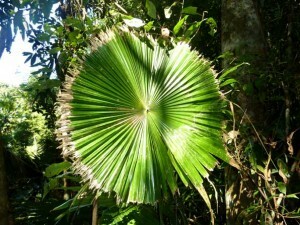 After that, I plead guilty that many a time in the forest, I have searched for this liana to taste its water. There is the common Boromthuri (Magnolia hodgsonii) which has a cone-like fruit with a bright orange aril entirely covering the seeds. They ripen in November and are strewn on the forest floor, pecked on by pheasants. I had only observed tree squirrels eating the seeds, but Rohit subsequently found that even hornbills eat the fruits occasionally. Then there is the Callicarpa, a short shrubby tree with large ashen leaves and small black berries that the bar-tailed cuckoo dove loves to eat. Then there are the really rare trees, several species from the Lauraceae, I still know only single individuals of. 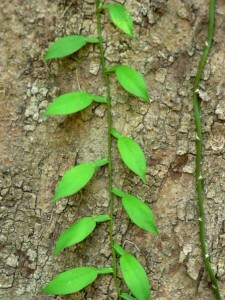 Many trees are patchy in the forest. Suddenly I find a grove of Amselleng (an Aglaia species) trees. Amselleng trees are not that common, but if you find one, look for several neighbours in the vicinity. Amselleng fruits are eaten by hornbills in the early part of the breeding season in March-April in Pakke, and while they have large seeds, rodents don’t seem to like them too much. They also don’t fruit every year. I rarely find many Amselleng seeds below hornbill nest trees. But maybe in the years they are available, they are dispersed in clumps and because rodents don’t eat them much, they come up in clumps forming groves in the forest. Yet, Beilshmedia, another hornbill-dispersed tree that fruits in the winter in the non-breeding season is also found in patches, but rodents appear to love the seeds of this species, and I wonder why so many adults occur together in patches in this species. And in another patch I find a grove of Chalmugra trees (Gynoecardia odorata). 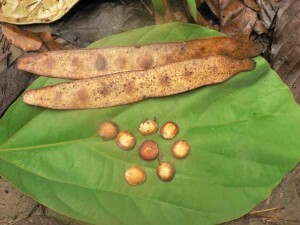 The species has large brown fruits borne directly on the tree trunk and branches. I have seen common palm civets feasting on them. Civets, unlike hornbills who regurgitate, bring out the seeds in their defecations, with many seeds of one or several species in small piles. I remember finding civet droppings with seeds of Gynoecardia. Just to check, I planted eight seeds in the faecal clump to see if they germinated. Seven seeds germinated into seedlings. Maybe if the seeds are not eaten by rodents, they can germinate and survive in clumps and that’s how we find these patches of Chalmugra trees close to each other, while at many places there are none. I find the pattern repeated in many animal-dispersed tree species. It could also be that these trees are simply growing in patches which have soil and moisture conditions most suitable for them, and animals that disperse their seeds or destroy the seeds have nothing to do where they grow and survive. But this possible connection with their dispersers and predators is somehow a more interesting line of thought for me. First one sees the patterns and then it’s neat to figure out why and how things are the way they are in a forest, although it’s often hard to do and it all seems like far-fetched story-telling. But leaving aside the questions, every trip to the forest is full of small discoveries and it’s a joy reconnecting with old friends and meeting new ones. There is also pain. Many trees I met – the friends I made – over the years are gone, cut down for fuelwood and timber by people who came from far away, from another place in Assam encroaching into miles and miles of forest which still stood in 1995. Those ‘forests’ are unrecognizable now, a few tree stumps in the middle of houses, shops and clumps of planted Areca and bamboo. These same stretches were once home to hornbills and other hole-nesting birds. A few isolated silk cotton Bombax ceiba and fig trees stand, reminders of what once was, but the next time I return, they too may have gone. A capped langur troop that lived in one patch, slowly disappeared one by one, with no food and shelter, chased and killed by dogs, electrocuted. A few lost individuals started to come and sit on the electric lines in the nearby village. Till one day, they too were gone. A Great hornbill used to nest on one of the huge Bhelu (Tetrameles nudiflora) trees near this patch. Narayan had found this nest in 1998 and a pair continued using the nest even after the tree was girdled in 2000 and every year, people felled more trees and set up their homes. Slowly after a couple of years, it fell and was chopped and taken away. I cannot imagine how the pair of hornbills must have felt when they returned to nest there. Their landmarks, their favorite food trees, perches in the forest vanished leaving an open ugly landscape. The road through Assam leading to Pakke is now a broken mud-track after a flood in 2004. And the trees and forest no longer line the road giving shelter and shade with their spreading branches. The sun is blindingly harsh on this barren landscape. In a few years, the tree stumps too will have rotted erasing all memory that once there was a forest here. Not so long ago. Miles of forests are being cleared everywhere to make way for plantations, mines, roads and farms. Asia has the highest deforestation rate. Yet in some way, those are just distant numbers. The vanishing of a patch of forest and the creatures that one knew, individual by individual, is so much harder to accept. Every time I pass those stretches, pointless tears come. And helplessness, anger and guilt that I could do nothing to stop this destruction. I could not even save that Great hornbill’s nest tree. Nice. Just incase, if you have closeup of Epipogium roseum flowers, I would like to see and also the tubers if possible. Yes, will send..what’s your email ID? That’s some nifty handler’s advice for tick attacks. Three months too late though. I’m still scratching away at the souvenirs my hosts at Parambikulam gave me. I wonder what they would have thought if I’d lit a fire in the forest, though. You’re right — I prefer leeches too. Wonderful piece of writing, in case I missed the point. Wow, Aparajita. One of the most educational rambles I have ever heard. Keep blogging. Beautiful aparajita! I really miss the forests. And, I have never seen hornbills feed on prunus here. 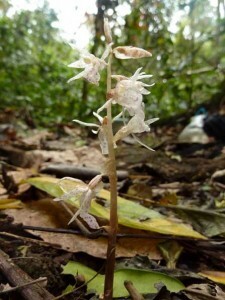 And wanted to tell you that I saw an orchid (Habenaria sp.) last year that I had never seen flower before. There was a bed of them in an area that I have been going to at least twice a week in the last ten years . 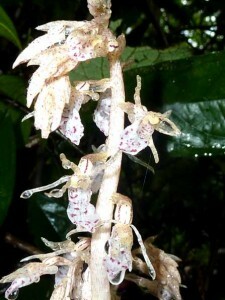 Some of these orchids seem to have these long cycles like kurunji. Species or individuals debate! – I think that when we work on the ground, individuals matter. When conceptual papers are written, it can be about the species. Thanks, Bijoy..it’s a very small fire..more smoke than fire and stamped out after:) no harm done in a rainforest. Divya..thnks..what are the Prunus species there? they must be eaten, if there..maybe true about the orchids..but sometimes, it’s just what we miss when we are not looking or we are there only at certain times. We also have Prunus ceylanica – although mostly in higher altitudes. Have been monitoring over 40 nests in this region in the last fifteen years – never recorded. The orchid I was talking about were in a large patch – a bed of them – not a solitary one that can be missed. Interesting reading Appu. Wonderful graduation from identifying plants from Central India (Bori) to Arunachal Pradesh. 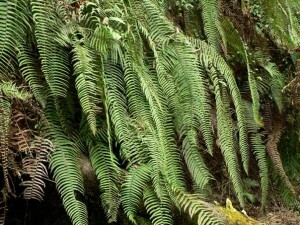 Similar large ferns in Sikkim are called Welcome Ferns as the two ‘arms’ of the fern seem to be welcoming people. Thank you, sir for reading and commenting! Must be the same fern (Dipteris wallichi) in Sikkim, it’s quite common. 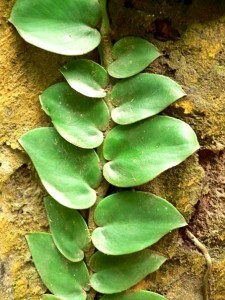 The name given in Sikkim is better..I just made up the other name I gave it – mirror image fern..because the two leaves are exact replicas of each other. Does Dipteris grow along streams only? when does it fruit there?..in Pakke, it fruits in winter in the non-breeding season, so I have mostly recorded regurgitated seeds in roosts apart from few sightings on fruiting trees..not at nests. yes, about the Habenaria..just meant that some things like Epipogeum, maybe it’s because I missed them at other times because I was not looking for them..should look up to see if flowering is in periodic cycles..figuring out why would be interesting. Yes, as far as I recall, I think I have only seen them near streams or moist places..